This section provides math worksheets where the facts and answers are provided, but the operation is missing. Fill-in-the-operation worksheets are a great way to learn fact families 'in reverse' or to provide reinforcement if memorization with other practice drills seems to have stalled. These are great practice for early grades where addition and subtraction have both been introduced, or later in 4th and 5th grade while learning both multiplication and division facts. These missing operator worksheets for addition and subtraction are great for helping students learn fact families and for differentiating between addition and subtraction. They are a great supporting resources when addition and subtraction facts are introduced in 1st grade, 2nd grade or 3rd grade. Put your fingers away, boys and girls! If you are learning multiplication and division fact families, you need to memorize the facts, but if you don't even know where to start just understanding which result makes sense can be a good step. These missing operator worksheets for multiplication and division build basic number sense and will get you on the way multiplying and dividing like a professional. 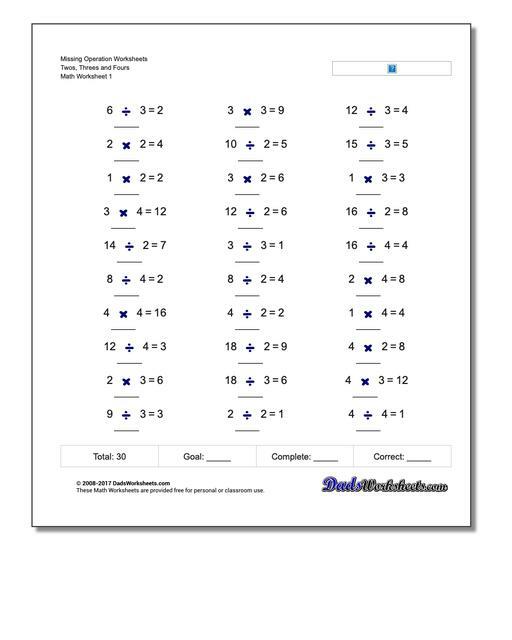 If you have mastered the addition and subtraction worksheets, as well as the mutliplication and division worksheets in the sections above, these worksheets will put all of your missing operations skills to the test. Some times operations such as addition and multiplication can be confused as these problems both produce results that increase. Similarly subtraction and division are both decreasing operations. The missing operation worksheets here combine all four math operations. If you are learning math facts, especially if you are using fact families, these mixed missing operation worksheets are a powerful tool for developing number sense as well as an intuition about which operation is important to solve various problems. This skill can be an especially important one when solving word problems and it can help get beyond rote memorization and into more concrete mental models of numbers. Once students have been introduced to addition and subtraction usually by the end of second grade, they may struggle when confronted with mixed worksheets that have both operations on them. These missing operation worksheets can help them develop the skills to know immediately which operation is appropriate based on whether a problem's answer is larger (addition) or smaller (subtraction) than it's operations. Multiplication and division fact families are critical steps in learning basic math, but relationships here can seem difficult if students haven't developed an intuitive number sense. These missing operation worksheets are a great exercies because they can help students understand that division facts produce smaller answers (quotients) and multiplicaiton facts produce larger answers (products.) These can be powerful tools for 5th grade or 6th grade students who are still struggling with multiplication and division concepts. When you're ready for more, take a look the fact family worksheets below if you haven't already!